While Windows 10 has been out for a while now, in recent months, we’ve started to see Microsoft push advertisements to the end users in various ways. Most of these ads started with the Windows 10 Anniversary Update and included ads in the Start menu, taskbar popups, notifications and on the Lock Screen. Now that the Windows 10 Creators Update is around the corner, Microsoft is starting to show ads in a new location; the File Explorer. 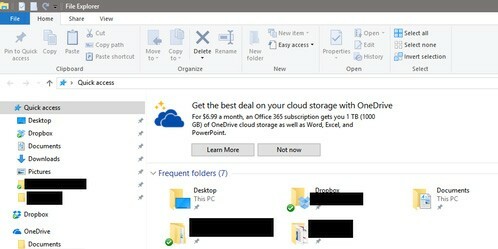 As you can see in the image above, they’re advertising their OneDrive service. This is only the beginning, as Microsoft could use this location to show other types of ads in the future. The setting to disable ads in File Explorer is a little hidden, but at least Microsoft made it easy to disable. Launch File Explorer and click View > Options. Move to the View tab and scroll through the list of options in the Advanced settings section. 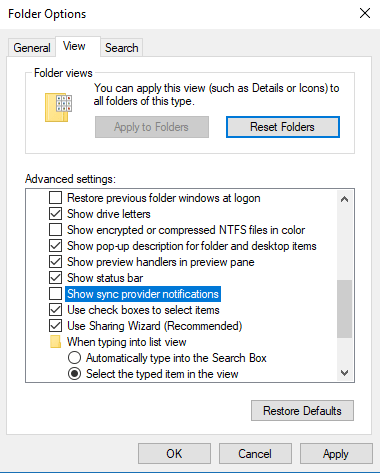 Towards the bottom of the list, uncheck the option labeled Show sync provider notifications. After unchecking the option above, you’ll no longer see ads in File Explorer. We would love to hear your feedback about these ads in the comments below.